The Extension Ridge area is between Harewood and Extension, to the west of Chase River - or east of Nanaimo Lakes Road. It's huge. 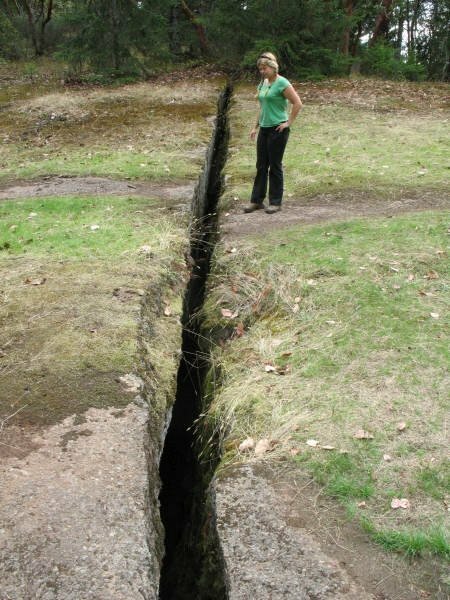 The whole area's been marred by clearcuts in recent years, but still has beautiful spots worth visiting, including the locally famous "Abyss", an earthquake fissure about 16 inches wide (wide enough for most people to fall into!). The Abyss is not some dramatic canyon, or anything. It's just a big crack in the ground. But it's still interesting - and nasty - you would NOT want your toddler or little dog to fall into the Abyss! There are lots of stories about this crack, though I haven't confirmed a single one. This area is beloved by mountain bikers, who've set up some fun wooden playgrounds in the area. There is a lot of exposed bedrock to ride on, arbutus groves, and long simple downhill trails where you can get some good speed. There are also petroglyphs here - figures and designs carved into the rock by some of the first people to inhabit this space. The petroglyphs aren't near the Abyss, but it's no surprise that they are in the same general area as a giant crack in the ground. Many peoples of the world have seen holes, cracks, and caves as portals to/from the spirit worlds. I wouldn't be surprised if the carvings and the chasm are both signs that this place was considered to be spiritually significant, a couple thousand years ago. This area can be accessed from a number of locations, but I'll just show one approach here. This should get you started!